There's an evil application that is eating ALL my upload bandwidth (I'm brazilian, it's only ~35kbps) for like 80% of the time my PC is turned on. I would like to know if there's any way to track this usage and discover what app is doing this. What about nethogs? In my opinion, it is lot more humane. Lists which command/program using network and how much bandwidth for each of them, in realtime. 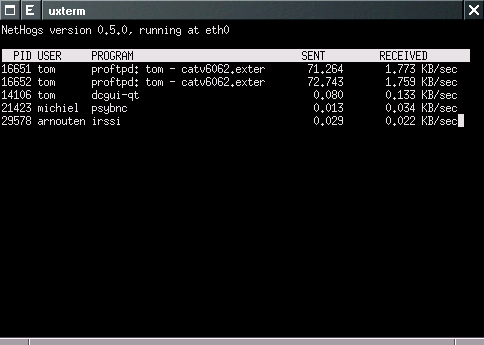 iftop is a console/shell-based program similar to top that can use the pcap library (also used by tcpdump and wireshark). It is available for Ubuntu from Universe. With netstat, you can find out what process is connected to a particular port or IP. For ports, its a good idea to prefix with a colon. sudo netstat -plantu | grep "some_port_number_or_ip_address"
You can get more information about the open files from lsof with -p PID. ntop is your friend. Packages are in linux repos and macports. This will show all TCP connections open and the process name/id attached to each. In my opinion, iftop's user interface is not well-designed. In practice there is hardly ever a need for viewing the IPs or hostnames in realtime. If I needed, a listing of all current connections, I would just go with netstat as jtimberman explained. nload is a great tool for monitoring bandwidth in real time and easily installed in Ubuntu or Debian with sudo apt-get install nload. Don't forget about the classic and powerful sar and netstat utilities on older *nix! You could do this at the router level depending on your firmware. For example, if you use DD-WRT, you could track usage over time and by machine. Not the answer you're looking for? Browse other questions tagged linux ubuntu networking monitoring or ask your own question. Is there a way to find out what application using most of bandwidth in Linux? In linux, how can you tell which processes use the most network bandwidth? How to monitor which application is consuming the network? How to track the user activities in Linux? How can I monitor network usage by process on Mac OS X? Monitor network traffic on a per-app basis in OS X? How can I constantly monitor my computer's RAM usage? How to track internet usage (upload & download) on Linux? How to get current bandwidth usage from command line using built-in Linux tools?